Amir Khan has had "one of the worst years of his life" as he quoted. He lost a close and controversial points decision to Lamont Peterson, who later failed a drugs test, and he was then stopped in four brutal rounds to Light Welterweight king, Danny Garcia. Khan still has dreams of becoming a world champion again, making today's fight with Carlos Molina one of the most crucial bouts of his career so far. There's not much I can tell you about Carlos Molina, he's a former Lightweight, he isn't known for a big punch and is extremely untested, this should make him tailor made for Khan. But I'd argue that Breidis Prescott and Danny Garcia were fairly untested before they stepped in the ring to face Khan, and look what happened there. The bottom line is, Khan would be a fool to look past Molina. He is known for calling out other fighters while he is already scheduled to fight, I don't think he has changed his ways, it was only the other week that I saw an article on BoxingScene with a quote from Khan saying "I will Knock-Out Garcia in a rematch." So he may never change his attitude mentally, but maybe his skills inside the boxing ring will change after switching trainers from Freddie Roach to Virgil Hunter. For many reasons this is a must watch fight. 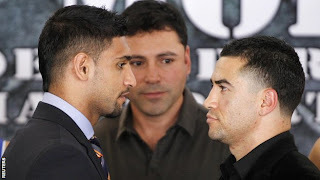 What's going to happen when Amir Khan and Carlos Molina fight tonight?